NNigerian Content Development and Monitoring Board will be hosting its 2019 Nigerian Oil and Gas Opportunity Fair (NOGOF) in Yenagoa, Bayelsa State. 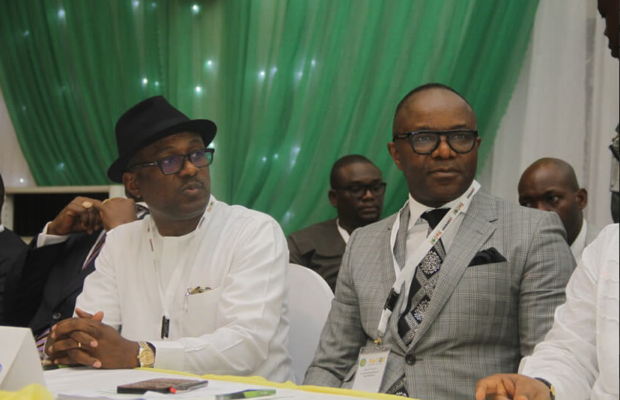 This fair is NCDMB’s 2nd biennial fair, its 1st was held in 2017. NOGOF 2019 will hold on Thursday 4th and Friday 5th of April at the new Nigerian Content Development and Monitoring Board Headquarters Oxbow Lake, Yenagoa, Bayelsa State. There will be a Welcome Barbeque at the Pond Park, Royal Tulip Castle Hotel (Government House) on the evening of the 3rd of April and a Gala Dinner & Awards Ceremony after the Opportunity and Technical Sessions on the 4th of April. Similar to 2017, on both days, there will also be an exhibition showcasing opportunities from different companies within this industry. At NOGOF 2019 the opportunity to connect with your next investor or partner, or even opportunity provider is greatly increased, as we already have over 50 presenters and speakers participating and over 1,000 delegates attending. This year’s fair is themed ‘Maximizing Investments in The Oil and Gas Industry for the benefit of the Nigerian People’ as the objective of this Biennial Fair is to bring together major players across the Upstream, Midstream and Downstream sectors as well as the Government Agencies and Industry Regulators, to showcase Opportunities in the Nigerian Oil and Gas industry and present available in-country capacity. With over 20 Project Opportunity Presentations by Chevron Nigeria Ltd, ExxonMobil Nigeria, Greenville LNG, Nigeria Agip Oil Company, Pinnacle Oil & Gas, Shell Petroleum Development Company, Total E&P Nigeria and many more Upstream, Midstream and Downstream Oil and Gas companies, this event is a must attend for you and your organization. During NOGOF 2019’s 2 days there will also be 4 Technical Sessions, each having 5 or more key leaders of industry such as Dr Maikanti Baru, GMD NNPC, Mr. Ye Shuijin President, China Chamber of Commerce in Nigeria (CCCN) and Mr. Olukayode Pitan, MD Bank of Industry on its discussion panels and notable industry players such as Mr. Anibor Kragha, Chief Operating Officer, NNPC Refineries and Toyin Olagunju, GM, Major Projects – SPDC as moderators for each session. The first session titled ‘Opportunities in The Nigerian Oil & Gas Park as a Critical Enabler of Economic Growth’ is aimed at reinforcing to investors that Nigeria is indeed ready for the oil and gas business and re-emphasizing the point that the park will bring about localization of indigenous companies where fabrication, pipe milling, procurement hubs, and oil and gas related technologies will flourish. The Oil and Gas Parks is one of the key initiatives of NCDMB and delegates will get a chance to learn all the details of how to benefit. The Welcome Barbeque on the 3rd will be held on the beautiful, serene and opulent grounds of the Royal Tulip Castle Hotel, former Government House now turned one of Nigeria’s only 5* Star Resort Boutique Hotels. The Golden Tulip Group of Hotels manages this breathtakingly scenic hotel. So, we urge our delegates to come and enjoy great music from our live band and DJ and excellent food, all packaged to ensure maximum networking and interaction with other industry colleagues, before we go into the serious business of Oil and Gas. In addition to this great line-up of activities, there will also be an Awards Ceremony during the Gala Dinner on the 4th during which awards will be given out to deserving companies in various categories, namely: Impact of Local Content Development Initiative on Nigeria and Industry; Multinational Operator with the most impactful Local Content Development Initiative; Indigenous/Independent Operator with the most impactful Local Content Development Initiative; Indigenous Service Provider with the most impactful contribution to Local Content and The Early Bird (Sponsorship Support for NOGOF 2019). Delegates will receive a complimentary copy of the latest, new and improved Compendium of Nigerian Content Opportunities in the Oil and Gas Industry 2019, a large size hardback coffee table book that contains all the opportunities that will be presented during the fair as well as a section on the local content specific opportunities. To avoid missing out on one of Nigeria’s most significant, relevant and beneficial Oil and Gas industry events, please visit www.nogofncdmb.com immediately to register. This event is hosted by NCDMB and organized by Jake Riley Ltd. Please visit our website for more information on the event. Delegates can start registering from 12noon on the Wednesday the 3rd of April as the fair will start promptly at 8:00am on Thursday the 4th of April 2019. The Welcome Barbeque will start at 4:00pm on Wednesday the 3rd of April at the beautiful Pond Park, Royal Tulip Castle Hotel (Government House). The Fair itself kicks off with an Opportunity Session on Thursday the 4th of April at the New NCDMB Headquarters Multipurpose Hall, Oxbow Lake, Yenagoa Bayelsa. The Gala Dinner & Awards Ceremony will start at 7:00 pm on Thursday the 4th of April.